Protect your home or basement from mold and mildew, and breathe easy with the Energy Star certified hOme 9 Gallon Dehumidifier. It quickly and effectively reduces odor and bacteria through its powerful built-in pump compressor, and removes up to 9 gallons (70 pints) of moisture from surrounding humid air per day. WATER REMOVAL: For manual removal: Turn off Dehumidifier when water tank is full, remove tank from Dehumidifier and empty its bucket. For continuous draining: Attach Dehumidifier drain hose outlet to female-threaded end of standard water hose before use. OPERATION: Dehumidifier automatically enters a 3-minute rest period after completing a moisture removal cycle. To prevent damage, do not start Dehumidifier during rest period. Operation starts again automatically when rest period is complete. 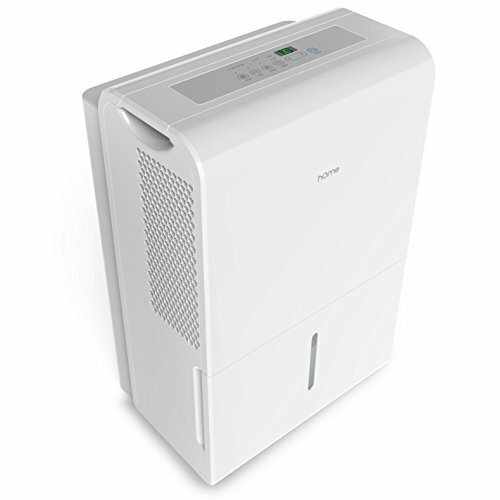 NOISE REDUCTION: To reduce noise during use, position Dehumidifier on level surface and ensure air filter is not clogged. IMPORTANT: Like most dehumidifiers, our 9 Gallon (70 Pint) model emits dry hot air from its fan during moisture removal. To help prevent significant increases in surrounding air temperature during use, we recommend it for large rooms or basements with a minimum of 2500 square feet.9-GALLON LARGE DEHUMIDIFIER: If your standard unit of measure is ice cream, our dehumidifier removes up to 70 pints from the air per day. But we measure in gallons (because we’re talking about water) to make the capacity easier to comprehend. This moisture-sucking beast is fit for any basement, cellar or large room, and it’s Energy Star certified, so it quickly and effectively absorbs moisture without racking up your energy bill. DESIGNED FOR THE MODERN HOME: That most dehumidifiers are clunky eyesores is news to nobody. We designed with the modern consumer in mind: a sleek, clean look our customers love, convenient built-in wheels and handles, and a quiet fan that won’t drown out your current binge-watching obsession. SUPER EASY TO USE: Dehumidifiers don’t need to be complicated, so ours isn’t. Adjust to your ideal moisture setting, then let it run its continuous 24-hour cycle until the tank is full, at which point it will automatically shut-off. Don’t got time for that? There’s also a drain hose outlet for continuous draining. The hose is not included; we recommend a ⅝” diameter garden hose with a female threaded end, and optionally Teflon tape for extra security. IMPORTANT THINGS TO KNOW – Dehumidifiers emit heat when in use (that’s how they absorb the moisture). This product won’t work in the same room as an evap cooler, and is intended for spaces between 2500 and 4000 SQ FT. It measures 15.4 x 11 x 24.3 inches, has a 1.6 gallon (6 liter) water tank capacity, and removes up to 9 gallons (70 pints in beer measurements) of moisture from the air per day.